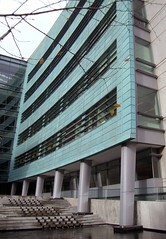 The Seattle Federal court building is very impressive in both size and contemporary design. The architects NBBJ provide a project description of the building on their website. The Seattle Daily Journal of Commerce also provides some statistics and stories about the building. – allowed to take my camera into the building but had to promise not to take photographs. – warned about the $100 for my cell-phone ringing in a court room. – required to produce a photo ID. – directed to a standalone touch-sensitive display system with terminals on every floor that provided information about the court cases and the building. I asked if the Murals and Sculptures in the huge atrium were exceptions to the no-photography rule. Alas, they weren’t. Like the English Crown court the Federal court deals with criminal cases. Its difficult to estimate the ‘interestingness’ of a case from its title on the touch sensitive display system: “The USA vs (person or corporation’s name)”. I chose a court where I discovered the judge was accepting guilty pleas and setting pre-sentencing requirements such as psychiatric and drugs assessments. The two cases I watched were illegal drug possession (Valium, Zoloft) by a diabetic in pain because of a kidney disorder who had just lost her job in a pharmacy. The second case was a violation of a parole requirement to avoid alcohol by an alcoholic. A striking design feature of this courtroom was how similar it is to the court-rooms I’ve seen in US films. There is a central isle through the public gallery to a low gate marking the entrance to the main court area. The barrier is purely symbolic, anyone could step over the low-wall, gate dividing the court from the public gallery. The public and the lawyers enter by walking down the isle. In the UK the door to the public gallery appears to be separate none of the court officials have to walk through the public. Depending on their status the accused enters through the public gallery (not yet proven guilty of anything) or wearing prison gear from a door in the main court area. Just before the judge entered the room the court clerk banged a gavel three times and called out ‘all rise’. 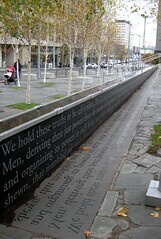 The Seattle federal court building has the declaration of independence decorating a low wall and is reflected (backwards) on the the floor in front of the Court building. This struck me as curious. A supersticious person might think that the declaration of independence written backwards was an omen of loss of freedom. Writing the document on the floor means that any one can walk on it, placing it on a long low wall is just too tempting for many dogs whos natural inclination might well be considered disrespectful of National treasure. This scribble was published on Wednesday, November 28th, 2007. You can follow any banter on this scribble with the RSS 2.0 feed. You can leave a response, or trackback from your own site.